Tourists are not the only ones swarming down the Champs-Elysees and through the Luxembourg gardens this summer. 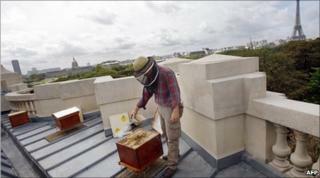 Thanks to a renewed interest in apiaries, Paris is fast becoming the urban bee-keeping capital of the world. The city now boasts some 400 hives and the number is growing steadily. Some are on the balconies of family apartments, others in public parks or on the roofs of famous buildings. Cultivation of a private honey store is now de rigueur for some of the top hotels and restaurants. The famous Tour d'Argent restaurant opposite Notre Dame Cathedral has just installed hives on its roof-top, as has The Westin hotel on the Rue de Rivoli. Driving the trend is growing public awareness of the crisis in rural bee-keeping caused by the collapse in bee numbers. Oddly, city bees are not just immune to the health problems facing their country cousins - they are also far more productive. According to Guillaume Charlot of the association L'Abeille de Grand Paris (The Bee of Greater Paris), a metropolitan hive produces 50kg (110lb) of honey in an average year, and up to 80kg in a bumper season. "A country bee-keeper is happy if he gets 30," he said. For the past 10 years the French capital has been officially a pesticide-free zone, which may partly explain its advantage. The warmth of the city environment also promotes early breeding. But paradoxically, the main reason for the success of urban bees is the variety of flora in the city compared with what is now present in much of the countryside. "City people like flowers. We have parks, we have balconies, we have roadside verges, we have gardens - and we are planting them all year round with lots of different species to ensure year-round colour," said Simonpierre Delorme, who keeps bees by a railway-line in the 14th arrondissement. "In the countryside, by contrast, these days there is often just one crop dominating an entire area. When that has finished blossoming, there is no more nectar for the local bees," he said. By early August most rural pollination is long over, but in Paris many streets are lined with non-native Sophora trees which have just started to blossom - allowing bees to keep producing honey much later in the year. Like other countries in Europe and the Americas, France has seen a worrying decline in bee numbers in recent years. Since 1995, 100,000 French hives have been lost and the amount of honey produced has fallen from 32,000 tonnes to 20,000. Bee mortality is three times what is considered normal. Most experts believe a variety of factors lie behind the crisis, from the dreaded varroa mite to pesticides, diminishing biodiversity and maybe even mobile phones. In Britain, the National Environment Research Council recently announced a £10m ($15.6m) research project into the decline, which could have severe effects on crop production. A century ago, there were more than 1,000 hives in Paris, but they almost totally disappeared in the decades after World War II. Among the first of the new generation was the hive installed 15 years ago on the roof of the Paris Opera, which today makes honey sold at the luxury goods shop Fauchon. Other colonies now live on the roof of the Grand Palais and on a skyscraper in La Defense business area. For ordinary home-owners, the rules are simple: hives must be registered with the veterinary authority and be more than 25 metres (82ft) from a school or hospital. According to Mr Charlot, the most commonly-used breed of bee is docile by temperament and stings are rare. "We did an analysis of the honey we made here in Paris and discovered that it contained more than 250 different pollens. In the countryside there can be as few as 15 or 20 pollens," said Olivier Darne, who styles himself as an "artist and urban apiarist". As part of his "Honey Bank" project, Darne creates bee-related art installations and organises street-tastings from his many hives - all to raise awareness about the decline of rural biodiversity. "It is an unwelcome paradox that city bees do better than country bees. I wish it was not the case. But if you exhaust your resources, you end up with nothing - and this is what the bees are telling us," he said.